On our first full day, we drove south of Halifax to Peggy's Cove, a "postage stamp" sized cove that is one of the most photographed in all of Canada. The tiny town surrounding the cove and near-by lighthouse purport to have some of the most beautiful scenery in the country. Of course, just our luck...the fog that greeted us when we first arrived at Halifax airport was still hanging around. So, our photos of Peggy's Cove are just a tad foggy. Not only did we have the fog to contend with...we also had several tour buses of people! 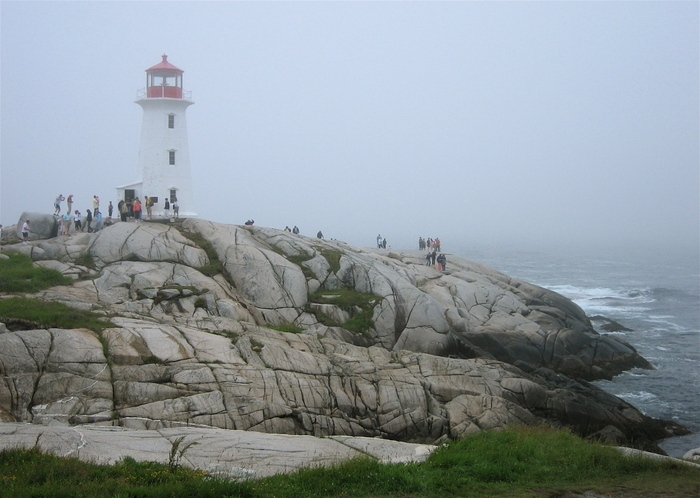 Peggy's Cove is a popular tourist destination. It is a beautiful lighthouse surrounded by rocks and waves. Peggy's Cove became the focal point of world attention in 1998 when Swissair Flight 111 plunged into the ocean off the nearby coast. All 229 persons aboard perished. Rescuers, families and media flocked to Peggy's Cove in the aftermath. 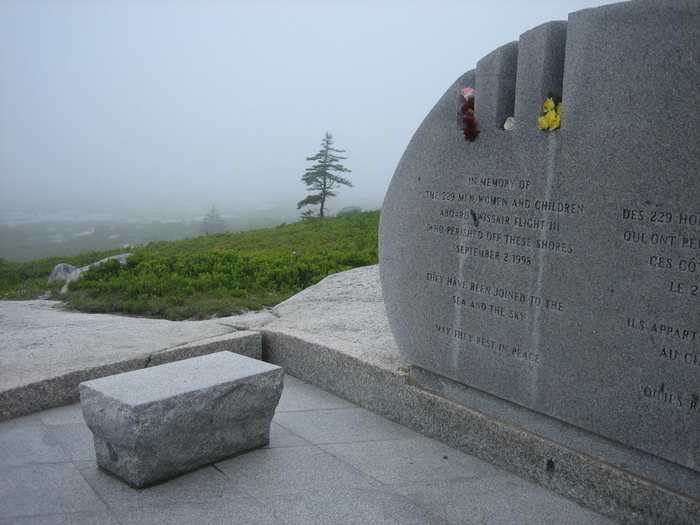 A memorial to those who perished in the crash is located a few miles south of Peggy's Cove. We ate lunch in a cozy little coastal town called Chester at a restaurant called the Rope Loft. In this picture, Chester is the town in the background. The tour book called it a "New England coastal town that just happened to end up in Nova Scotia." It did remind us of several towns in Maine. Why a photo of this car you might ask? 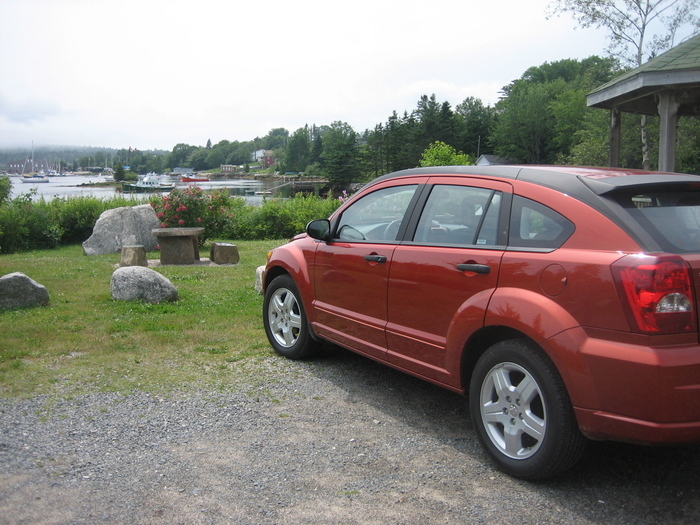 Well, it's our rental car...a Dodge Caliber that is decidedly orange. Actually, it turns out that orange is a popular color for cars in Canada. Go figure! Ken took to calling this car Kiva, after our orangish corgi. Further south, we visited the town of Lunenberg, known as one of the province's prettiest and most interesting towns. 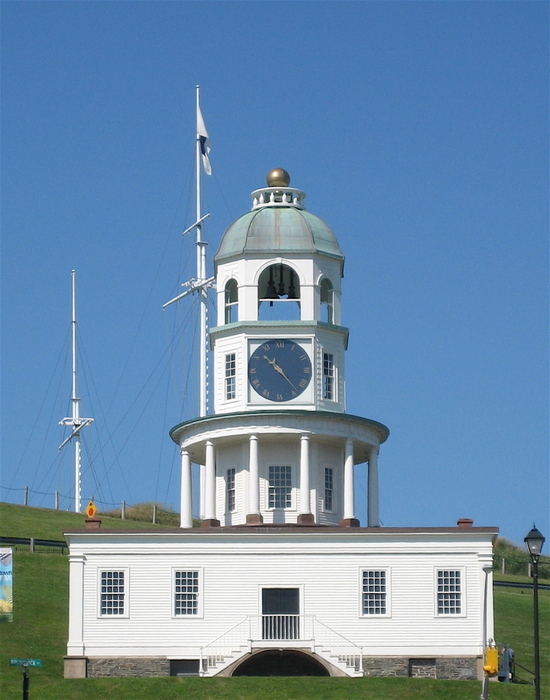 It was Britain's second attempt at colonizing Nova Scotia (the first being Halifax) and was laid out by the province's chief surveyor in 1753. The original architecture has been amazingly well preserved, so much so that the Old Town has been designated as a World Heritage Site by UNESCO. This house is an example of the architecture, which includes the unique "Lunenberg bump", the roundish dormer with windows at the top of the house. Here, family members would watch the harbor for the arrival by ship of loved ones. The Old Town of Lunenberg sits on the side of a hill, which allows for a wonderful view of the town and harbor from the local golf course. Notice all the red buildings on the waterfront. Our horse-and-carriage tour guide told us that red was chosen for these buildings because it was a color well-seen in the fog. She added that, of course, red was one of the cheapest paint colors and was used on many of the ships...thus another reason possibly that the buildings were painted red. Another story she told us was that in Lunenberg, as in many other coastal towns, lobsters used to be easily harvested after being washed up on the beaches. It was such a common food back then that the poor kids supposedly took lobster to school for lunch, while the rich kids took exotic peanut butter and jelly sandwiches. In the local jail, lobster was served at each meal every day; legend has it that the inmates vehemently protested and finally were promised to have lobster served no more than 4 days of the week. Man, what a difference from today, eh? The power of supply and demand! We returned to Halifax for our second and last night there. Halifax has a wonderful boardwalk downtown along the harbor. Here we visited the Maritime Museum of the Atlantic, containing many interesting exhibits including one on the Titanic. 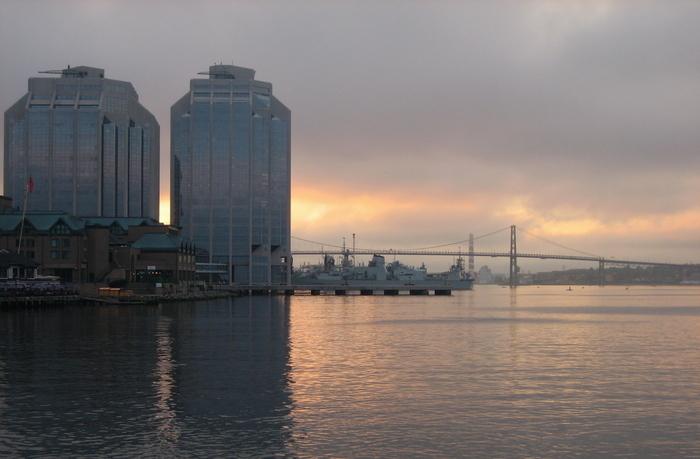 Halifax was the nearest large port to the site of the sinking of the Titanic in 1912. It was from Halifax that search and rescue operations were organized, although all that crew members were able to retrieve were memorabilia collected by crew members at the wreck site and the bodies of victims, many of which were buried near Halifax. After visiting the museum, we strolled along the boardwalk and were eating dinner just as the sun went down over the harbor. Before leaving Halifax, we visited the Halifax Citadel, a national historic site and Nova Scotia's most visited attraction. Built between 1828 and 1856, this amazing fortification is the fourth to occupy the hilltop site. Re-enactors of soldiers from the 78th Highlanders hold drills daily according to instructions laid out in manuals from the 1860's. 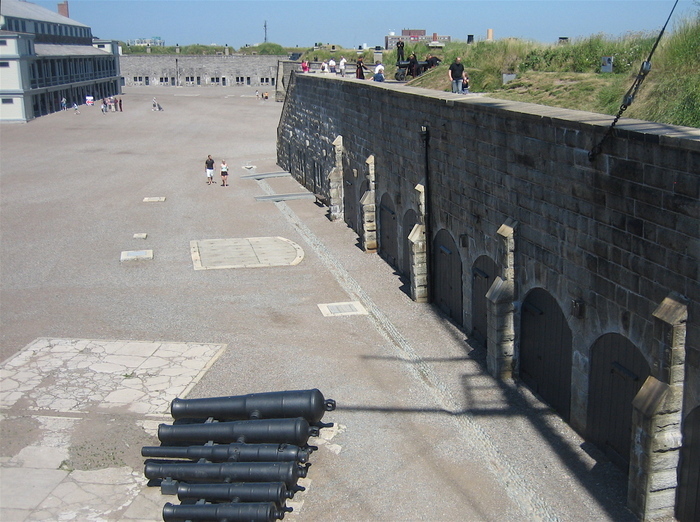 The present Citadel was built to prevent a land-based attack on the naval dockyards and as a defense against American invasion, which remained palpable in the wake of the War of 1812. 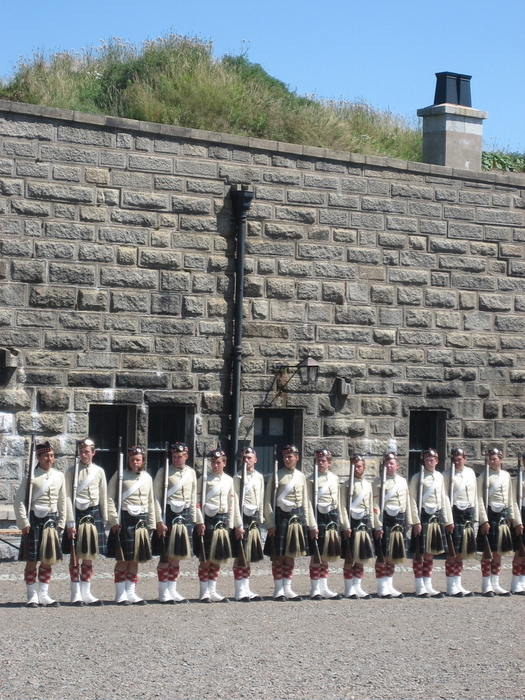 No attack ever came, but today the Citadel is a true source of national pride for those who are citizens of Nova Scotia. 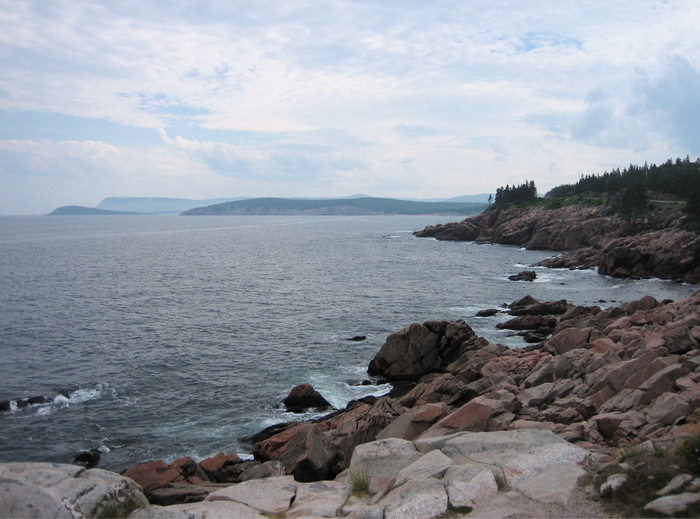 We drove north from Halifax along the Eastern Shore of Nova Scotia. It was a beautiful alternative to the Trans-Canada Highway. 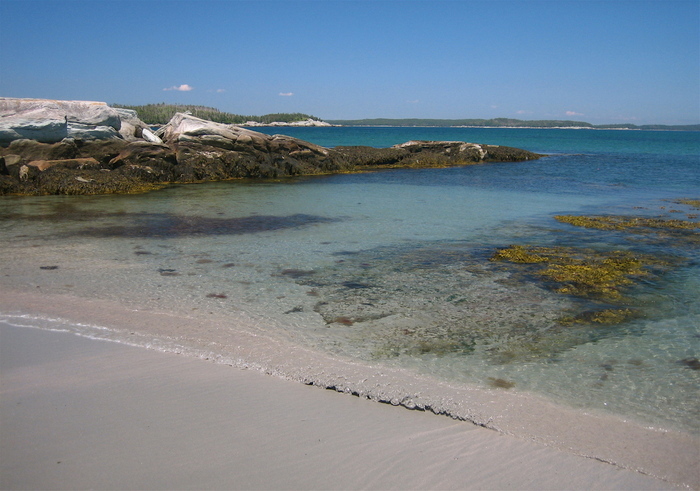 Largely undeveloped, it is an area of rugged wilderness lakes and gorgeous coastal beaches. This one had water so turquoise that we were reminded of the Mediterranean. The drive was about 200 miles to our final destination of the evening. Along the Marine Drive, we stopped at Taylor Head Provincial Park, a beautiful setting for a walk along the beach. 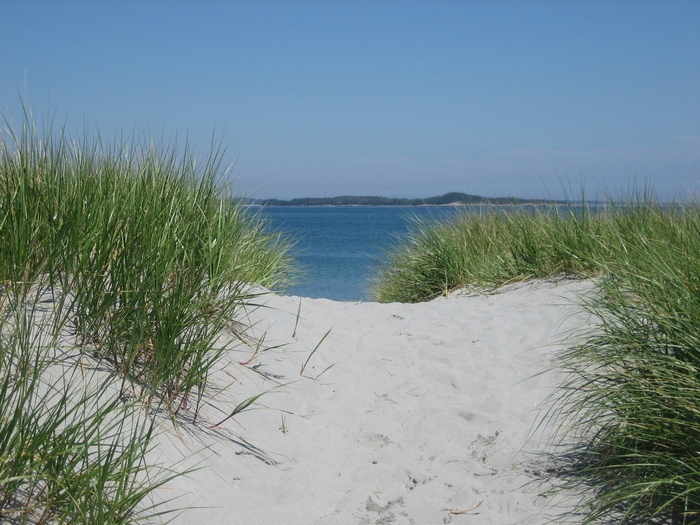 The dunes and sand grass leading us to the beach reminded us of Coastal North Carolina, where Judy's parents live. 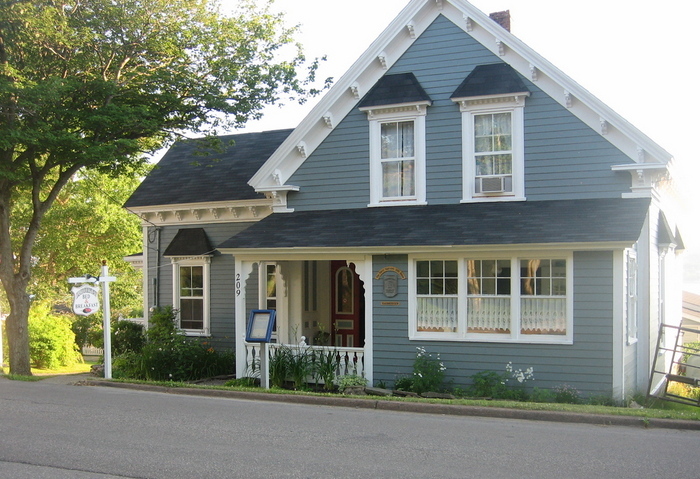 We spent the night at the Harbourview B&B in Port Hawkesbury at the southern end of Cape Breton Island. 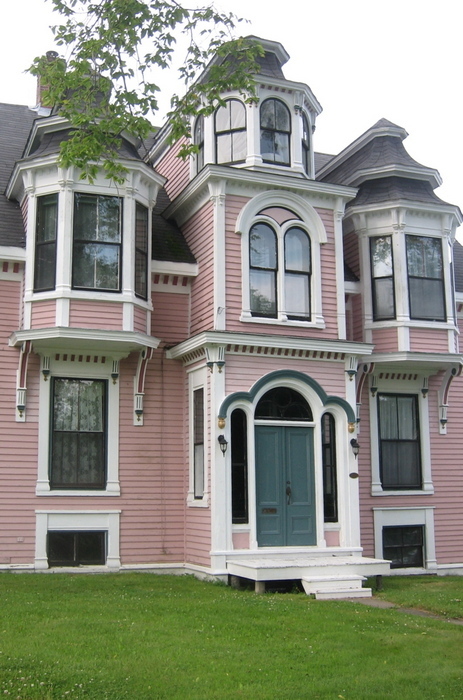 This house was built in 1880 for Ferry Captain James Embree. 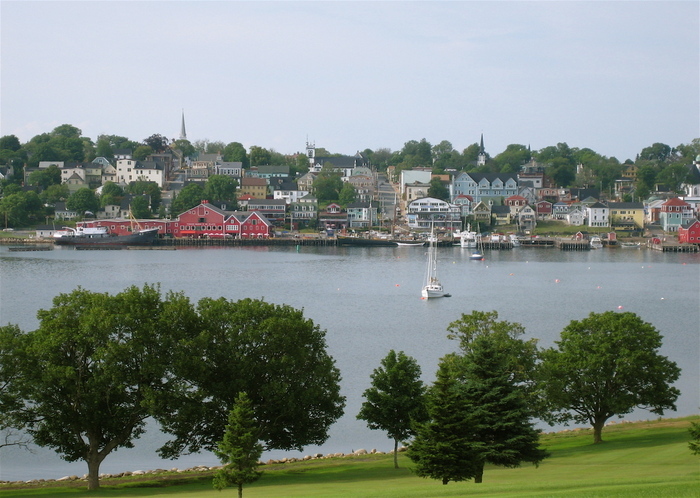 His father was one of the first settlers in Port Hawkesbury and was granted a charter to operate a private ferry across the harbor from this land. James operated the ferry until 1912. The house was restored to near original condition and, because of its historical value, was designated a Provincial Historical Property. Our bedroom was at the back of the house, overlooking the harbor. 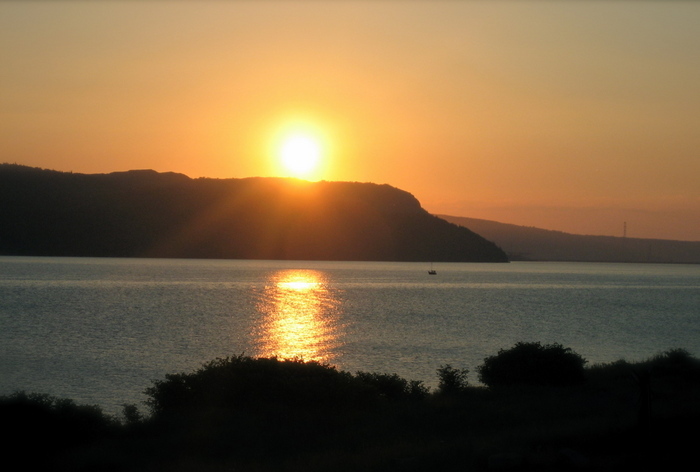 Port Hawkesbury is located on the southwestern end of Cape Breton Island, on the north shore of the Strait of Canso, in the Canadian province of Nova Scotia. 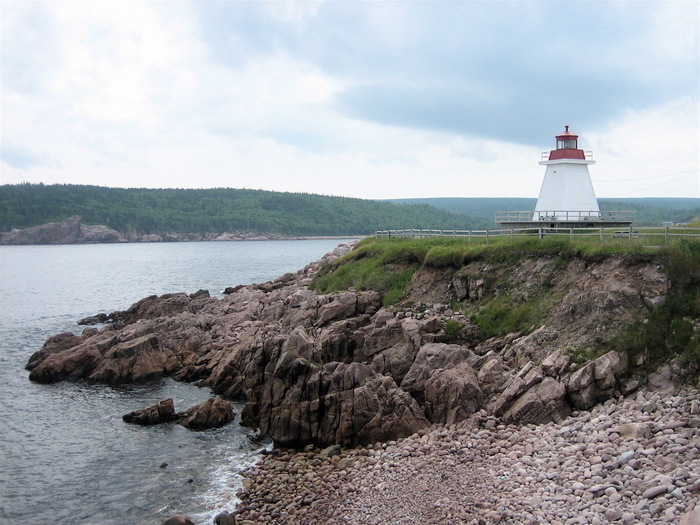 It was founded in 1789 and since then the harbor has been a service center to the island of Cape Breton. Today, there are only about 4000 residents in Port Hawkesbury, and the traffic in the harbor is no where near what it used to be. The sunsets are spectacular! 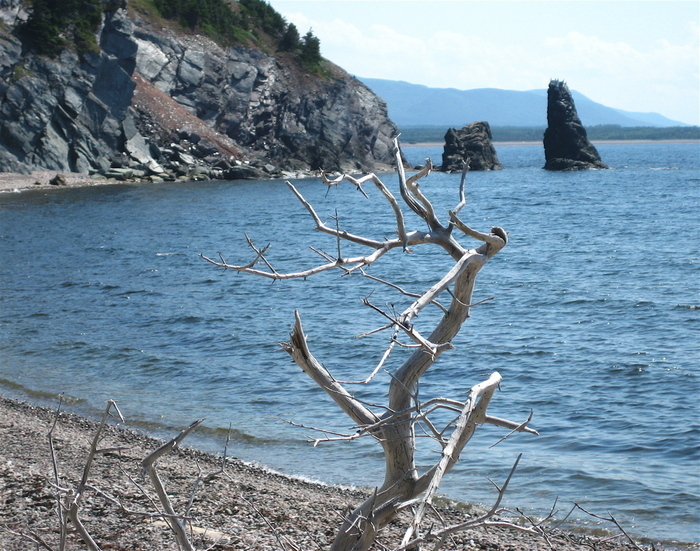 Today, we drove up the west side of Cape Breton Island along the Ceilidh Trail. The term ceilidh (pronounced "kay-lee") is a traditional Gaelic social dance originating in Ireland and Scotland, but now common throughout the Celtic ethnic populations. The Gaelic citizens of Cape Breton are proud of their culture and keep it alive through their wonderful music, public ceilidh events, and even road signs that are in both English and Gaelic. 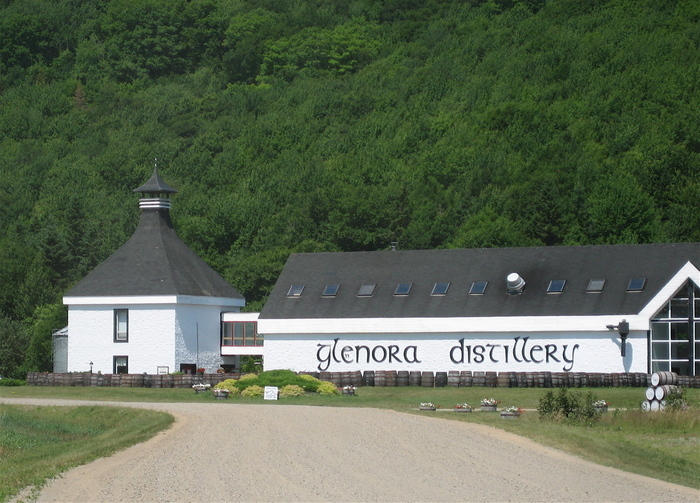 One unique institution that is particularly Scottish is the Glenora Distilery, located in Mabou, Cape Breton. They claim to be North America's first single malt distillery. They can't call their whiskey "Scotch" since it's not distilled in Scotland! We toured the facility and got to taste test the smooth, sipping whiskey made here. We eventually made our way to the Cabot Trail which follows the rugged coastline, providing spectacular views of the ocean. The trail passes through an Acadian area, where descendants of the first French settlers in North America live. The Acadians have a rich history in Nova Scotia and Newfoundland, although one very sad part of it forced some Acadians to migrate south, eventually settling in what is now Louisiana to become the the Cajuns. Just south of Cheticamp, an Acadian community, is one of the most bizarre sights we saw on our trip, Joe's Scarecrows. It is an attraction that causes almost all tourists to stop and stare. The story goes that Joe tended crops on land that was 3 miles from his home. To keep rabbits, deer and other critters away, from the crops, he put up some scarecrows. Eventually, he had over 100 scarecrows. After some vandals one night destroyed all but one of the scarecrows, Joe pledged to recreate them and began soliciting donations from those who stopped to see the scarecrows. Eventually, his daughter and son-in-law erected a restaurant and gift shop on-site. Now, Joe claims that approximately 30,000 people annually visit the scarecrows from all over Canada, every state in the USA, and 29 other countries. Each scarecrow is made of two boards, real clothes, a Halloween mask, and strips tied to their arms to make noises that scare away animals, although there are no crops these days. 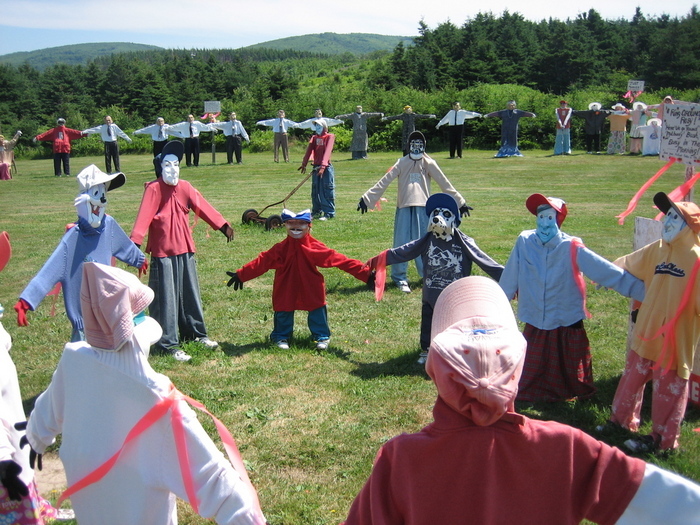 In this photo, the scarecrows in the back, dressed in black pants and white shirts, are world leaders including Clinton, Reagan, Carter, Bush, Gorbachev, and Blair. What a riot! Along the Cabot Trail, we saw some of the most stunning coastline. The trail, named for the 1497 landing of John Cabot in Atlantic Canada, is one of Canada's most popular tourist attractions. One interesting note...historians now agree that John Cabot probably landed in Newfoundland and not Nova Scotia 500 years ago. 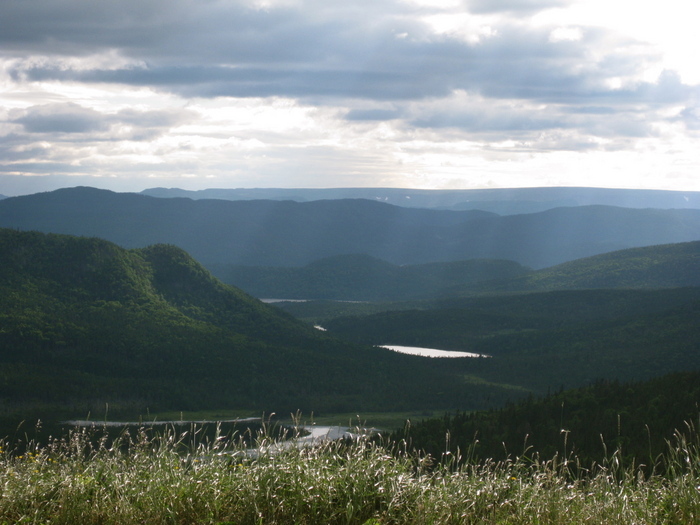 According to the official park brochure: "Cape Breton Highlands National Park is known for its spectacular highlands and ocean scenery. Steep cliffs and deep river canyons carve into a forested plateau bordering the Atlantic Ocean. One third of the Cabot Trail, a world famous scenic highway, runs through the national park along the coasts and over the highlands....Designated as a national park in 1936, Cape Breton Highlands covers 950 square kilometers and is one of the largest protected wilderness areas in Nova Scotia." According to Ken and Judy: "Ooooo, ahhhhh." Before settling in to our room at the Highland Breeze B& B, we went into the bay with Wesley's Whale Watch Tours. They promised to find whales for us (or the trip was free) and to provide us with close-up encounters with whales for awesome photo opportunities. They didn't disappoint...we saw lots of long-finned pilot whales, including several babies! And we also got to hear their whale-song both with and without the assistance of underwater microphones. It was a wonderful evening. Dawn, our tour guide on the boat, was very informative about the whales and also what to expect from our B&B host, Anna. We were warned that Anna loves to feed people, and feed us she did. That night, we enjoyed fresh-from-the-oven gingerbread with ice cream, and the next morning our breakfast was cooked to order and then some! We had a lovely time with Anna and would highly recommend the Highland Breeze B&B to anyone (www.highlandbreeze.com). Before enjoying our gingerbread and ice cream, we ate dinner on the patio at the Rusty Anchor Restaurant. It was delicious...although Judy did not like the mussels, which are a local delicacy this time of year (at least she tried one! Uhum....Ken!?!). We watched the sun set from the patio and felt at peace. 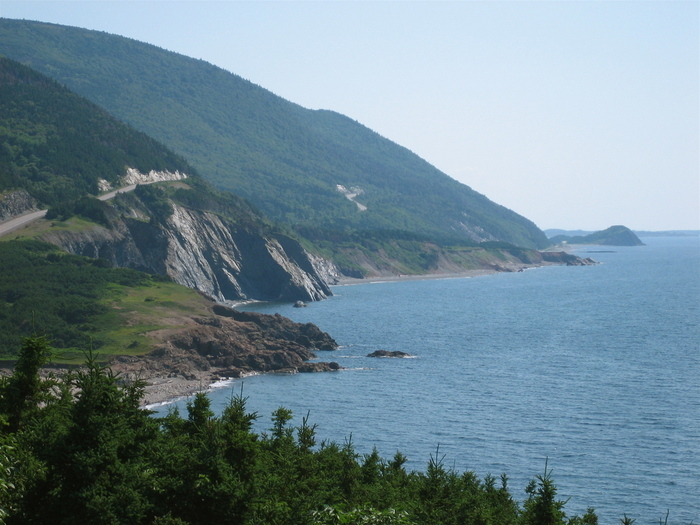 We continued through Cape Breton Highland Park along the Cabot Trail, eventually turning south along the eastern side of the island. An alternate coastal route took us to Neils Harbour, where we ate lunch at the Chowder House near the lighthouse. Before lunch, we took two hikes today, one in the Park and one to the end of White Point. Both were lovely! This picture is from the other side of the lighthouse, with it to our backs. Just couldn't get enough of this coastal scenery!! We then continued from Neils Harbour south towards Ingonish, where Ken took a 6 mile hike along a peninsula behind the Keltic Lodge. Judy enjoyed sitting in the sun, reading a book while he did that. 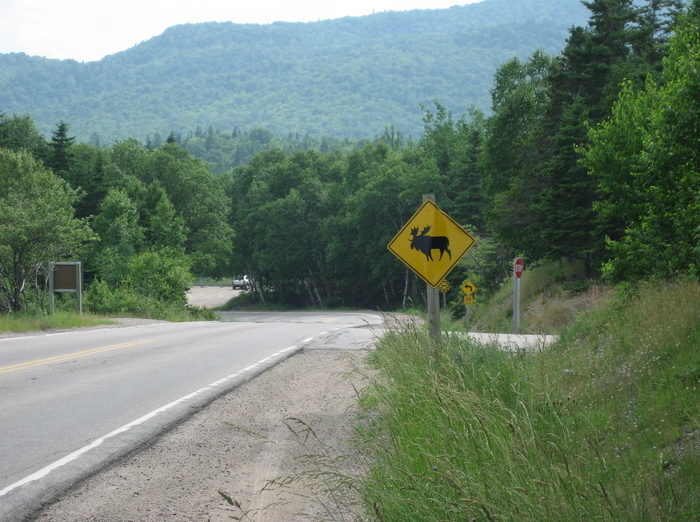 So far, the only moose we had seen were the moose silhouettes on the road signs. Geesh! They kept telling us to watch out for the moose. We must have watched a little too well, because we just didn't see any. We continued to the end of the Cabot Trail, into the town of North Sydney, where at 8:30PM, we got in line for the ferry to Newfoundland. What a night we were in for! 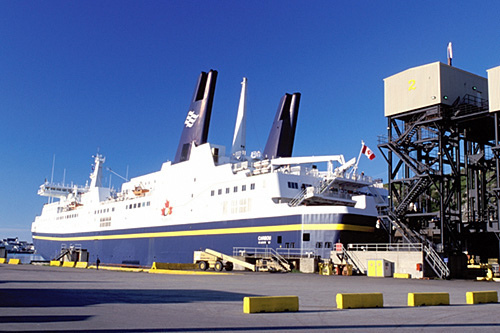 The ferry from North Sydney, Nova Scotia, to Port Aux Basque, Newfoundland, left late. We finally drove on to the ferry around 3:30AM, and it left an hour later. We slept when we could while waiting in the car for the ferry to leave, which was a challenge, and on the ferry itself, which was an even bigger challenge! This is a stock photo we of the ferry that we found online. We arrived in Newfoundland around 10:00AM NT the next morning. What is "NT" you might ask? It stands for Newfoundland time, which is a half hour later than Nova Scotia. Never heard of a time zone that was half an hour different! The ferry ride to Newfoundland covered 172 km (106 miles). After such a sleepless night, we did virtually the impossible by driving 400 miles straight up to the northern most point in Newfoundland. We simply took turns driving and sleeping and didn't even stop to take a picture, despite some amazing scenery. Our plan was to enjoy it all on our trip back down, which would be much more leisurely. We made it to L'Anse Aux Meadows and Marilyn's Hospitality Home just after dinner. Dinner was some of the freshest, best tasting cod we had ever in our lives had! This is the view from our room at Marilyn's which was small but cozy. At other times of the year, we might have seen icebergs out of our bedroom window. Marilyn was looking at one from the kitchen window in June when we called to make our reservations. She and her husband have lived virtually their whole lives in this little cove. The two nights we were there, he was out cod fishing in Labrador, so we only got to know Marilyn. We really, really liked her and were so glad that we ended up staying in her B&B. She, as do other Newfoundland women, called each of us staying with her "my love". 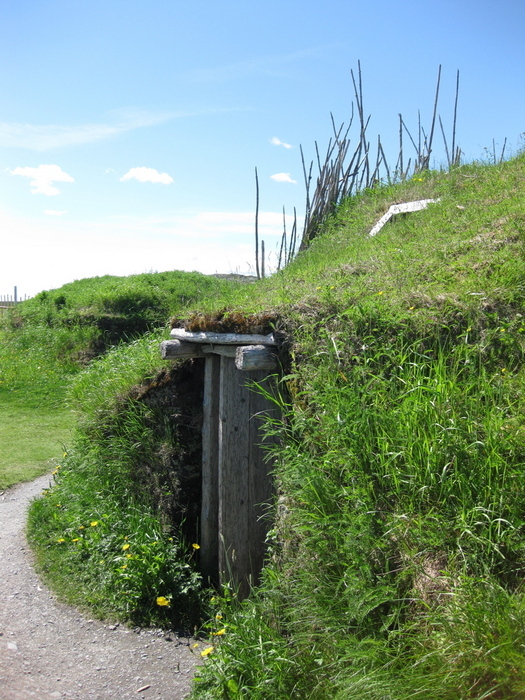 The next morning, we visited L'Anse Aux Meadows National Historic Site. It the only documented site of a Viking landing in North America. 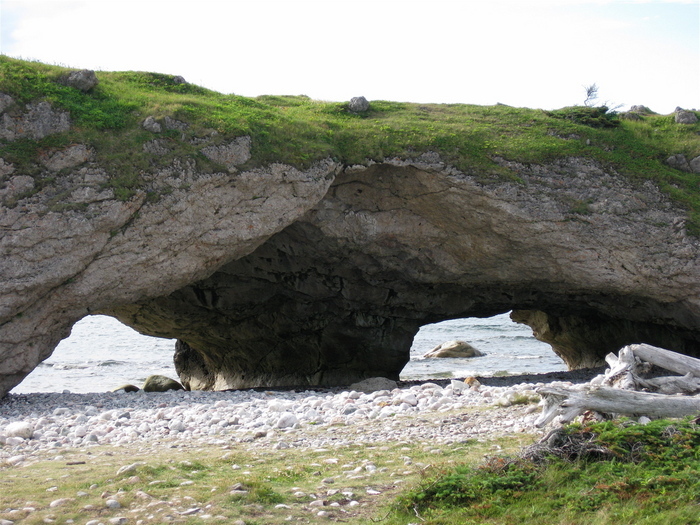 A Viking expedition from Greenland-- possibly led by Leif Eirikson, son of Eiric the Red -- landed here around the year 1000 and established a camp that served as a base for exploring south through the Gulf of St. Lawrence. The site was discovered in the 1960's by Dr. Helge Ingstad, a Norweigan historian and explorer, and his wife Anne, an archeologist. After 12 years of research, it was declared an historic site based, in part, on the fact that it provides the earliest evidence of Europeans in the western hemisphere. 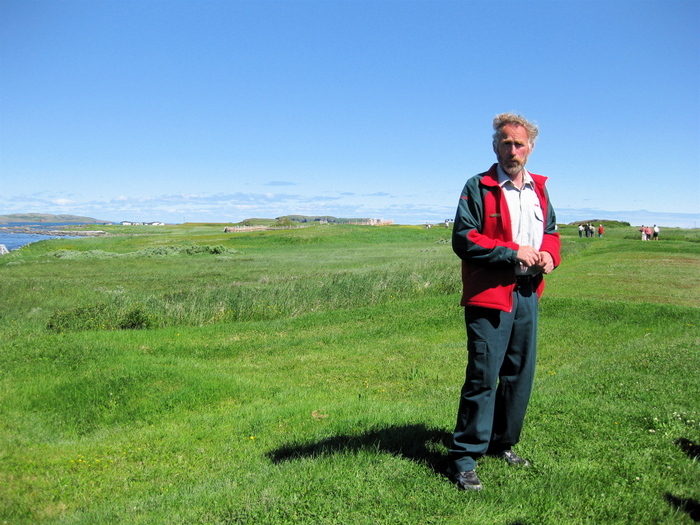 Clayton, a life-long resident of L'Anse Aux Meadows, was our guide at this UNESCO Heritage Site. His tiny village is in the back left of the photo. Clayton gave us the Parks Canada approved tour speech, while including many his own stories from his childhood before the Norweigan researchers arrived and while they were there. In this picture, Clayton is standing on some of the grassy mounds that turned out to be Norse dwellings. Evidence of more than eight Norse dwellings were discovered at L'Anse Aux Meadows, as well as artifacts including evidence of extracting iron from the bog to make replacement boat nails and a brooch pin used with cloaks. After the archeological research was completed, the dwellings were recovered with earth in hopes of protecting them further until such a time when improved technology might help researchers learn more from the site. Several dwellings were recreated nearby and staffed with re-enactors to show visitors what life might have been like for the Vikings more than a thousand years ago. Between the Visitor's Center and the ancient and recreated Viking dwellings stands this sculpture. 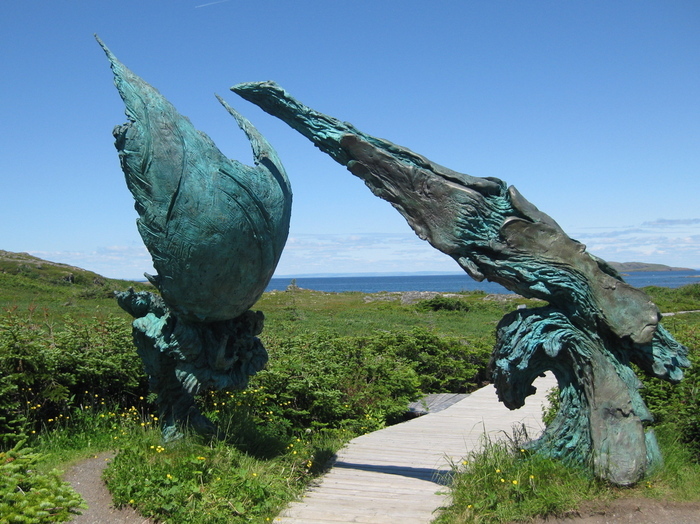 The "Meeting of Two Worlds" was crafted in an attempt to capture one aspect of the historical significance of L'Anse Aux Meadows. As Clayton explained it to us, if the idea that human life originated in Africa is true, then it would make sense that humans spread out to points west and points east to populate the earth. The Canadian aboriginal cultures represented one extreme ending of this population expansion, while the Europeans in Greenland represented the other. The natives and the Vikings that met (and fought) in L'Anse Aux Meadows would have been the first documented interaction of two worlds reunited. This is the intended significance of the artists, one of whom was a Canadian immigrant to Newfoundland from Bulgaria and the other was from Sweden. The sculpture was unveiled in 2000 at the one thousandth anniversary celebration of the Viking landing. 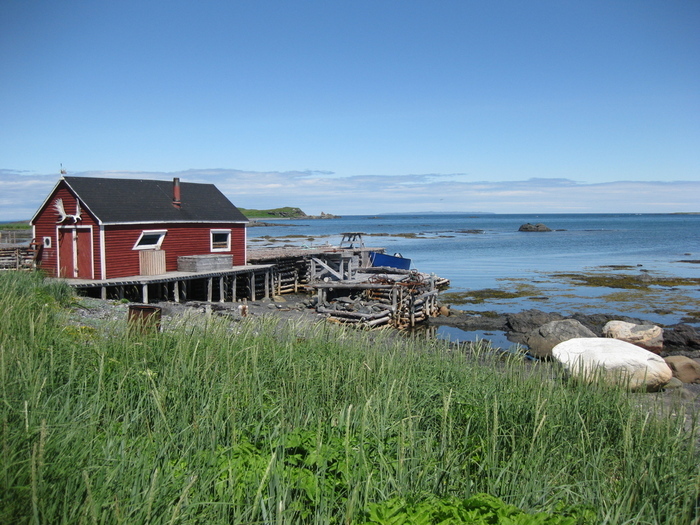 There are only about 30 people now living in L'Anse Aux Meadows. When the Norweigans came to this tiny village in the 1960's, it was a self-sufficient village cut off from the rest of the world. The road was cut through the Northern Peninsula about 10 years later, mostly due to the research at the historic site. Today, according to Clayton, most of the residents are in their 80's. After the last resident moves away or dies, the village will become a Parks Canada property and will be razed, allowing visitors to the historic site to see the landscape as it might have been seen by the Vikings. In this photo, notice the moose antlers on the boat house. It was a sight that we saw often on our trip. Finally, we got to see some moose!! These females were munching wetland grasses. We were alerted to their presence by a young couple we saw dash from their car with camera in hand. 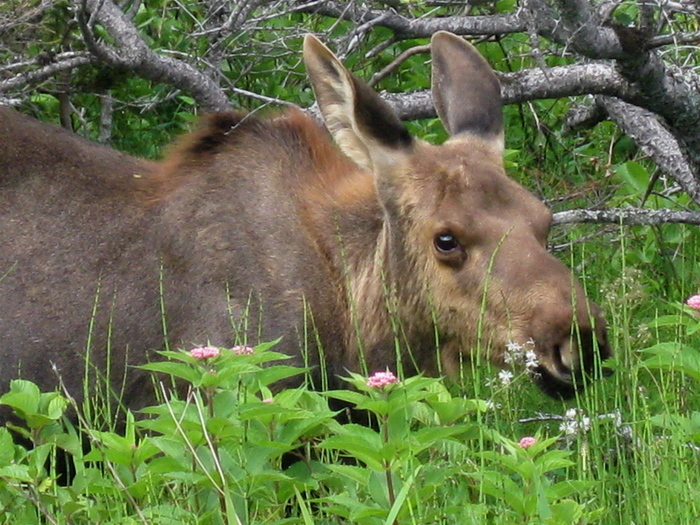 When we caught up to them, the husband told us how his wife, who had desperately wanted to see a moose, had screamed for him to stop the car when she spotted the animals. Of course, as he was telling us this story, he mimicked his wife's screams perfectly. So well, in fact, that the moose heard him and were scared. 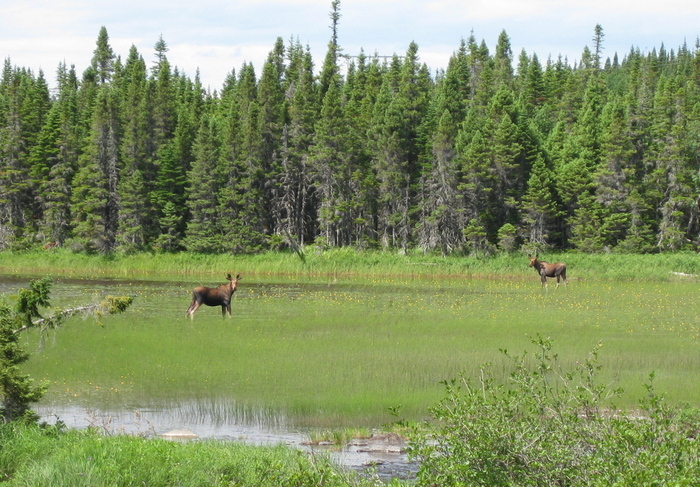 So, we also have a picture of the moose fleeing the wetlands in haste! St. Anthony is the largest northern town on the Great Northern Peninsula with a population of about 2500. The history of European settlement of St. Anthony reaches back to the early 1500s, when French and Basque fishermen used the well-sheltered harbour as a seasonal fishing station. Today, the major industry is tourism, with visitors coming in large part to see icebergs and whales. Unfortunately, we saw neither on this day, but we enjoyed a delicious lunch at the cafe in this lighthouse's old keeper quarters. Hmmm, we're starting to wonder if the color of the Canadian lighthouses or the Canadian flag came first. On our way back to Marilyn's Hospitality House, we drove along some other roads to do a little exploring. This landscape near Burn Cape was particularly of interest to us. It provided some interesting textures for some interesting photos. We joined other guests at Marilyn's for a home-cooked meal prepared by Marilyn herself. The main course was moose (does this count as our second moose sighting? ), which was absolutely delicious prepared much as a beef pot roast. Others at the table told us that moose tastes great any way it is prepared...more like beef and not at all gamey like venison can be. She also served us fish brewis, which is a traditional Newfoundland dish of cod and hard bread prepared together resulting in a stuffing-like dish. For dessert, she served us ice cream with partridgeberry sauce that she had prepared from fresh berries just before dinner. Partridgeberries, known as lingonberries in other parts of the world, are small, red berries that grow in Newfoundland. Known for its berries, Newfoundland has other native berries including cloudberries, squashberries, crowberries, and wild blueberries (go to www.darktickle.com if you would like to order some for yourself). We liked the partridgeberries best. After dinner, we watched a beautiful sunset...but our evening wasn't over yet! After dinner, Marilyn took all her guest to Skipper Hot's for drinks and also to be Screeched. 'Screeching' someone visiting Newfoundland for the first time is a longtime custom of many older bars in Newfoundland, in which the person is to drink a shot glass filled with Screech, wear traditional Newfoundland sea-faring garb (think Gorton's Fisherman), kiss a codfish on the mouth, and recite a phrase in the Newfoundland dialect, one almost impossible for non-Newfies to understand. This photo is some of the other guests who were screeched with us: Ken and Carol from Ontario (guy with the white t-shirt and the woman standing to right of him) and the last two on the right, Jacques and his long-time girlfriend from Quebec. Now, you may be asking what the Screech was that we drank. Newfoundland Screech is a particularly strong liquor sold in Newfoundland and originally imported from Jamaica, enjoys fame in many parts of Canada. The story goes that Screech was first created in the days of the Triangle Trade, where the same barrels were used to carry molasses and rum, and only occasionally cleaned. The barrels built up a deposit of impossibly sweet sediment at the bottom, which was melted out with boiling water and either fermented or mixed with grain alcohol. This concoction eventually became known as screech, because it was so strong and vile that one screeched loudly after having drank it. The Screech sold legally today in liquor stores both in and outside of Newfoundland is blended and bottled by the Newfoundland and Labrador Liquor Corporation. However, many Newfoundlanders do not view the NLC-bottled Screech as the genuine article, as stronger Screech that cannot be legally sold continues to be blended and distributed in a manner outside the law. We drank the legal kind. It wasn't too bad...pretty much like other kinds of rum. 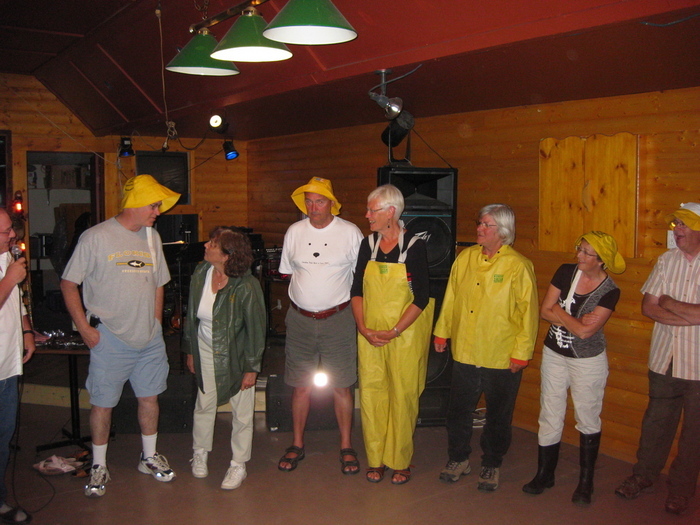 Afterwards, we received a certificate proclaiming that we are now Honorary Newfoundlanders. We left Marilyn's Hospitality Home after saying good-bye to our new fellow Newfies and drove back down the Great Northern Peninsula. 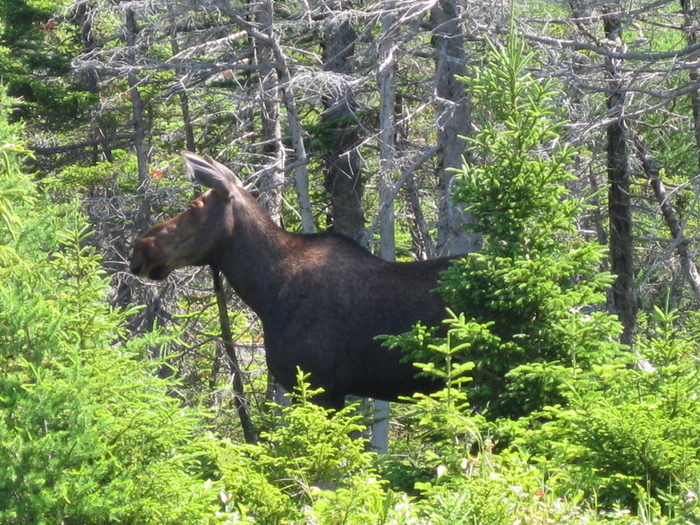 Along the road, we came across another female moose grazing along the road. She happily posed for a picture. Many of the native peoples in Canada (as well as many other cultures in the northern-most North America) have traditionally used inuksuit (plural). They are stone markers or cairns used for navigation purpose and are often in the shape of a human. 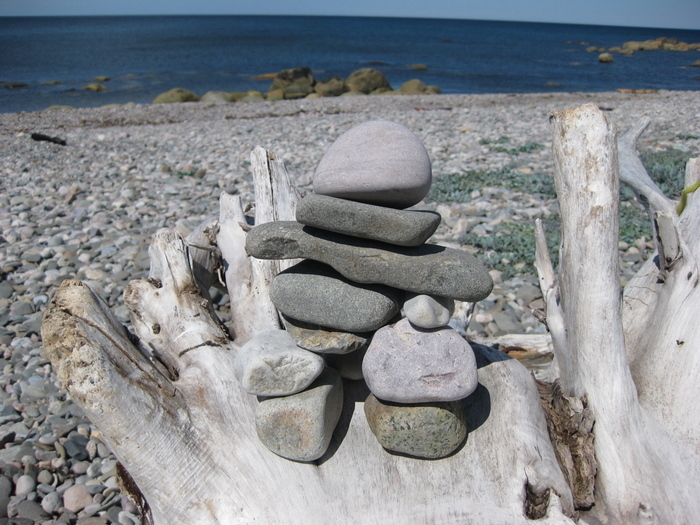 All along our trip, we saw inuksuit: figures of onyx and other stone in the gift shops, on brochures and book covers, along the road, and on the beach at several of the tourist stops. Judy was intrigued by these stone figures and decided to attempt one of her own. It's not as easy to create one as it might seen, requiring stones that fit together without toppling. Her inuksut is cute but not at all as well-put together as the real deal. Arches is one of the look offs we explored. 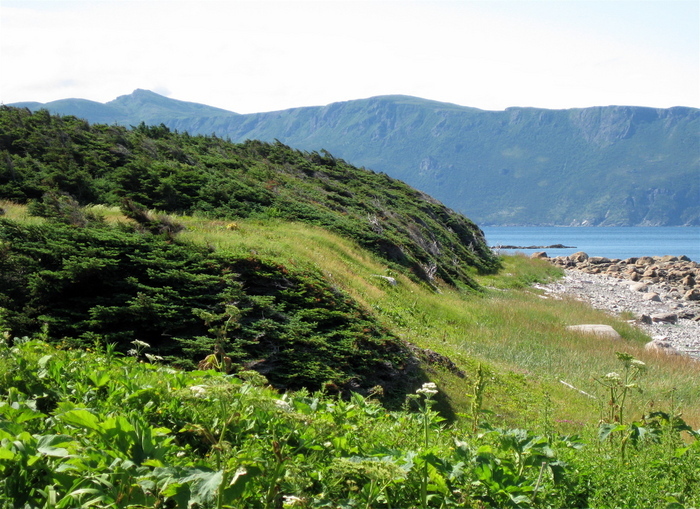 It's just at the northern end of Gros Morne National Park. 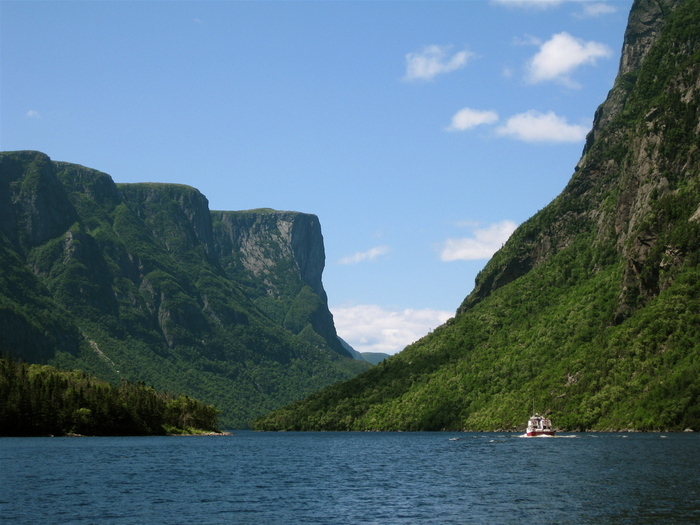 Because of its geological significance, UNESCO declared Gros Morne a World Heritage Site in 1987. The geology of the park is spectacular. 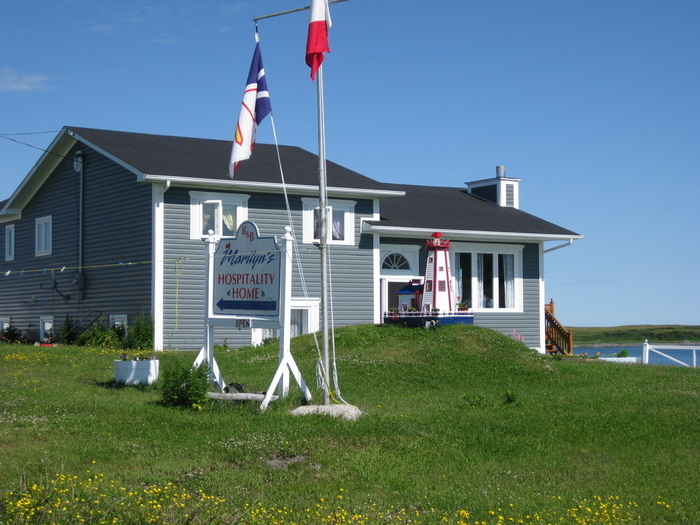 After a day of driving about 200 miles, exploring little towns, sight-seeing look offs (that's what they call them in Newfoundland), and one large town -- Port Aux Choix -- we stopped in Rocky Harbor to stay at the Fisherman's Inn. 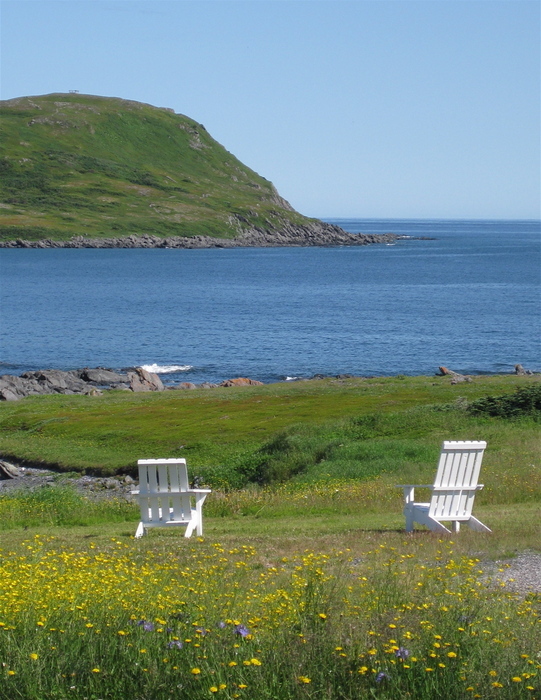 Just north of Rocky Harbor is Lobster Cove, part of Gros Morne National Park. In Lobster Cove, there is this beautiful lighthouse. Notice the covered breezeway that was built from the lighthouse keeper house's to the lighthouse itself. 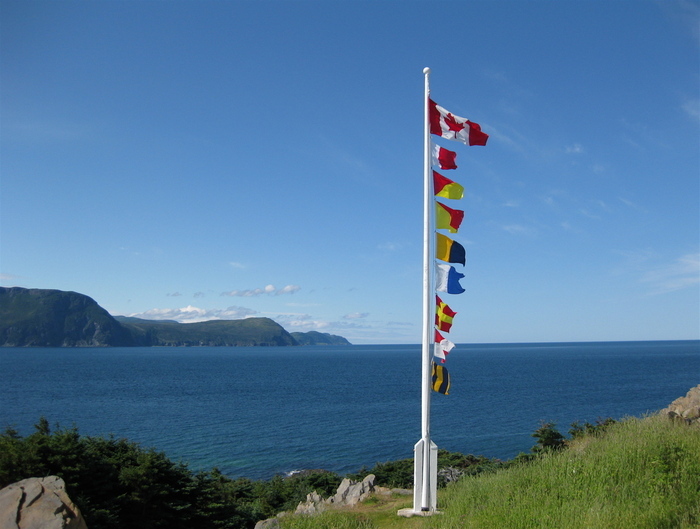 Many of the lighthouses in Canada, as probably in the US, used to fly nautical flags as a way of communicating with ships. Today, more modern means of communication have obviously replaced the use of flags. 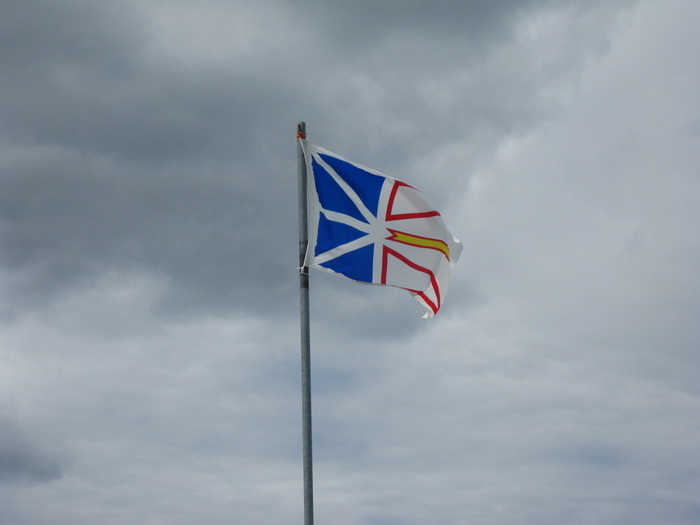 At the Lobster Cove Lighthouse, they still fly flags, but the messages they contain are more of a puzzle for tourists. The answer to the puzzle is a term that is relevant to Canadian culture. In this photo, the flags spell out "hook a rug" (with one of the Os backward by mistake), referring to the local craft of making large and small rugs for decoration. Ken and I purchased a small one of these rugs with a Canadian maple leaf in fall colors. We loved watching the sunsets on our trip. 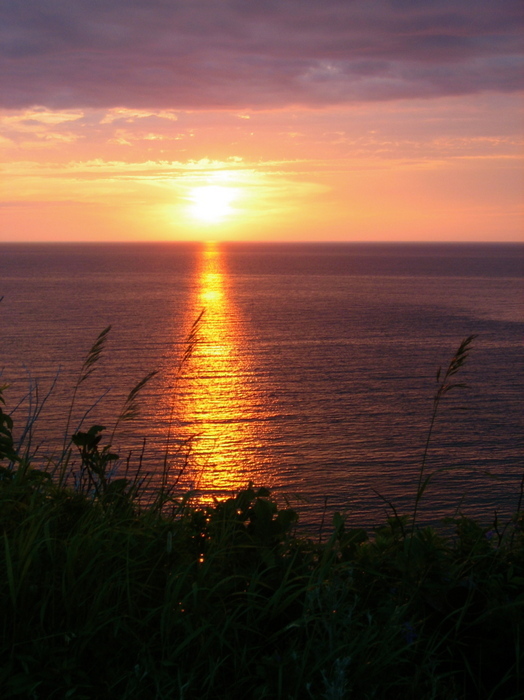 Most nights, as our pictures demonstrate, we saw lovely sunsets. 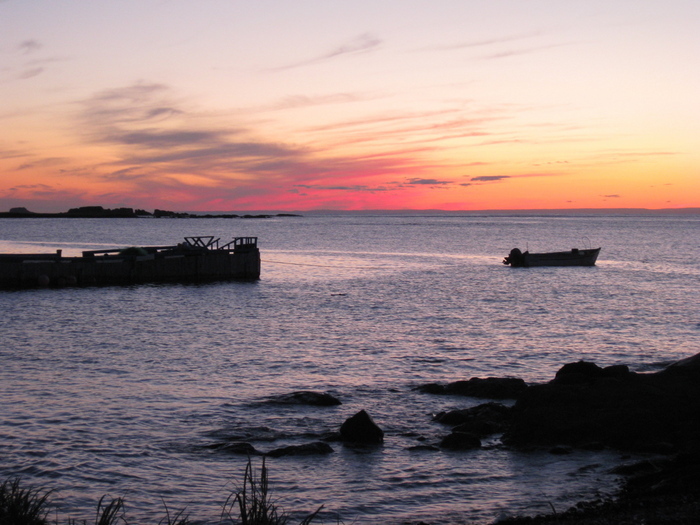 The sunset on this night as seen from Lobster Cove was no exception. 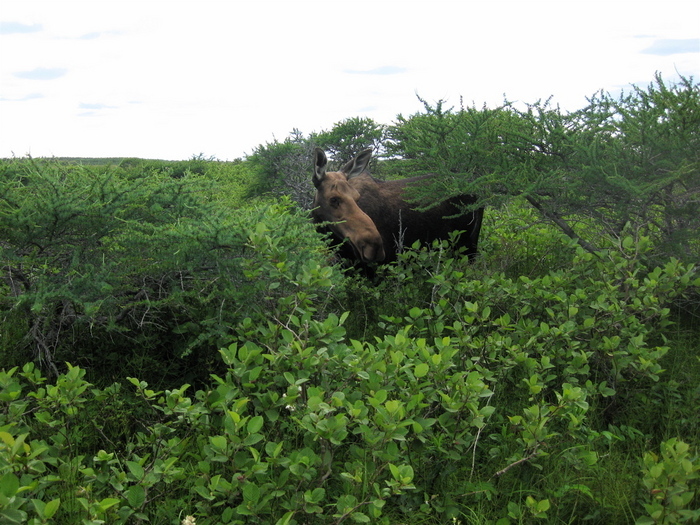 Gros Morne National Park has many different kinds of trees, shrubs, flowers, and grasses. On the beach, the shrubs and trees are greatly affected by the winds that come off of the sea. In this photo, notice how the shrubs (the dark green areas) are almost flat against the grass-covered dunes. It was just incredible to us, especially Judy, how they contoured to the land. 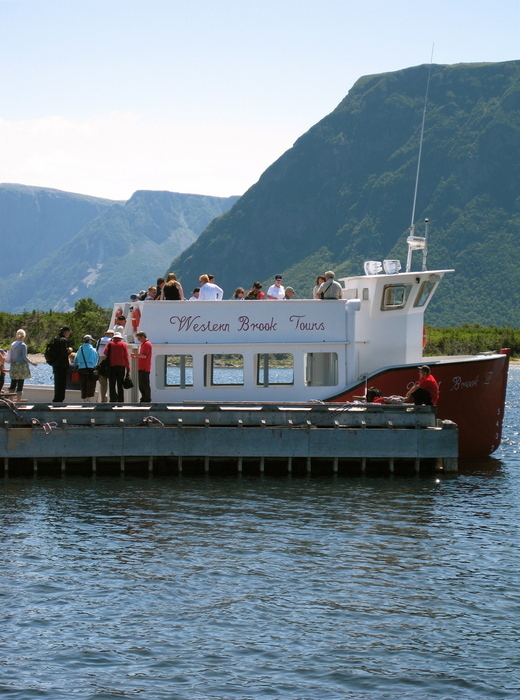 This morning, we took one of Gros Morne's most popular tourist attractions, the Western Brook Pond Tour. To get to the pond (which in the US would definitely be called a lake) we had to hike about 4 km across a bog that cuts off the fjord that is now Western Brook Pond. The entrance to the fjord can be seen in the distance where there is an opening in the mountains. Because the bog and marshland now cut the fjord from the ocean, it truly is no longer a fjord. What it is is just spectacular! After our hike, we got on one of two boats to travel the length of the 16 km long body of water that is called a pond. This wasn't the boat that we got on; this one supposedly seated 98 people....we took the smaller one which supposedly seated 78 people. All I can say is that we were glad it wasn't totally full. It was hard enough to get a seat and not have people step on our toes as it was! Ah well, we were there to see the scenery, not be comfortable. It was well worth any discomfort. 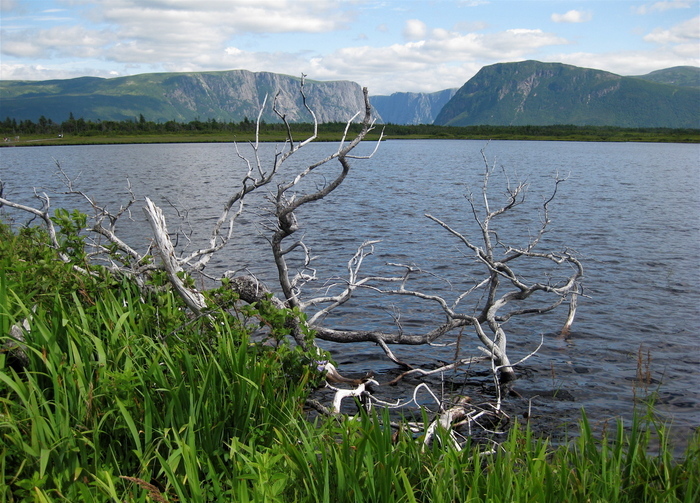 Western Brook Pond is in the Long Range Mountains, the most northern section of the Appalachian Mountains. It is surrounded by steep rock walls that are as tall as 2,000 feet. These steep walls were carved from the surrounding plateau by glaciers. After the glaciers melted, the land rebounded and the fjord was cut off from the sea. Salty water was eventually flushed from the fjord leaving it fresh. 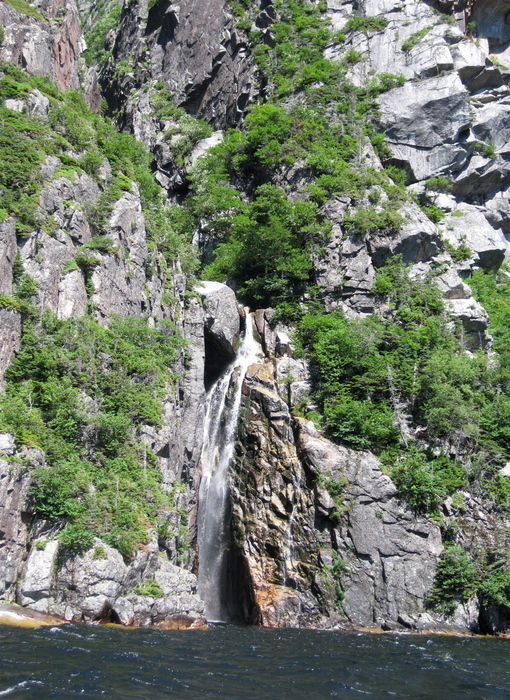 It is fed by Stag Brook at the extreme eastern end of the lake and by numerous waterfalls cascading from the plateau above. The one pictured here is a trickle compared to what it would look like in the spring when the snow is melting. It is truly beautiful here! 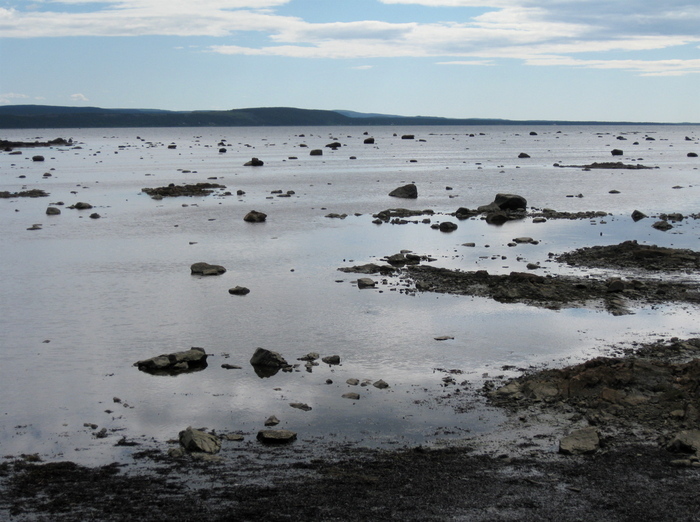 The lake waters are pristine, having had very little impact from human activities. The tour boat operators have to undergo special certification to ensure that their operations would have minimal impact on the environment. The two guys that were our tour guides were wonderful about giving us plenty of information on the history and the geology of the area. Not a single trace of human beings...except for the tour boats. It really was a wonderful afternoon. ...her baby. He (let's assume it was a he) was a little farther from the path than was his mother, but the concern was getting between them. We've all been told never to get between a wild animal (especially a moose, which can be pretty nasty) and her baby. But, this mother seemed not to mind. As people continued on the path between her and this little guy, she calmly continued to graze. You can tell from this picture that the little one wasn't as calm as his mother was. See the look in his eyes?? Anyway, it was a precious moment for us. 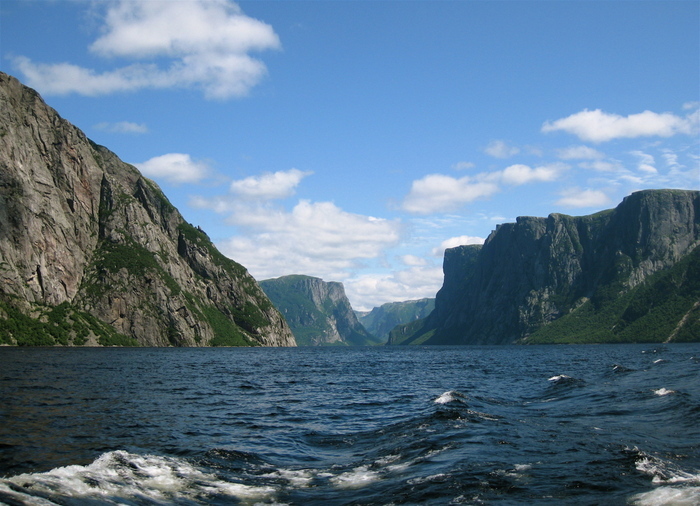 After our tour boat ride, we continued south along the Great Northern Peninsula, leaving Gros Morne National Park. What a magnificent place! We wished we had time to see more of the park that we did. Just means we'll have to come back one day! We spent the night in Gander. Located on the northeastern shore of Gander Lake, it is the site of Gander International Airport, formerly an important refuelling point for transatlantic aircraft. Ken remembered his parents talking about having to stop in Gander when they traveled to Italy in the 1960's. In the morning, we continued our travels and went through Terra Nova National Park. At its visitor's center, we learned about the park and got to see some of its sea life. This is a cod. 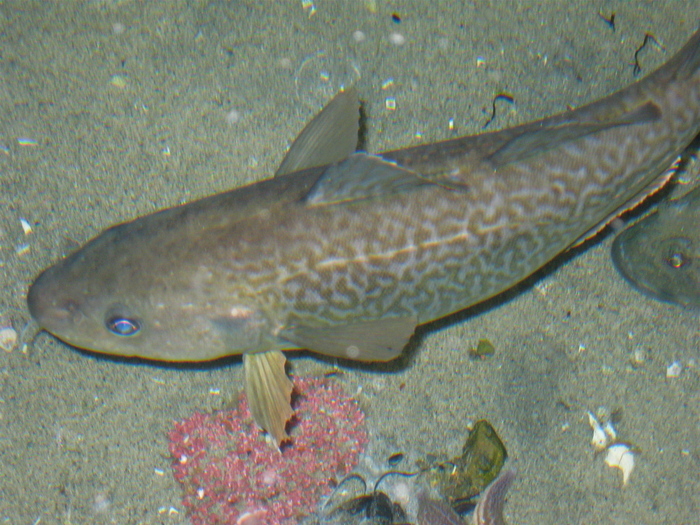 Cod played such a huge role in the history and economy of Atlantic Canada and the Northeastern US, as we were to learn the next day. We stopped at the little harbor town of Trinity. 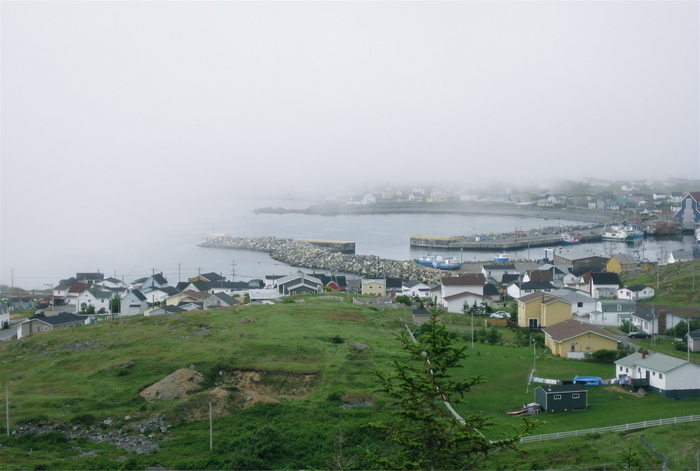 Trinity is a small town located on Trinity Bay, and its harbor was first used by fishing ships around the 16th century. The Portuguese explorer Gaspar Corte-Real is said to have named this place because he arrived here on Trinity Sunday in 1501. 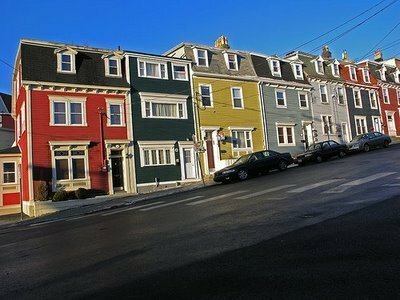 It was settled by merchants from Poole in England during the 18th century and was once a town larger and more important than St. John's. The town contains a number of buildings recognized as Registered Heritage Structures by the province. Trinity was used as a filming location for the 2001 film "The Shipping News". We stayed at Captain Blackmore's Heritage Manor in Port Union, the stately historic oceanside home of Captain John Hann Blackmore, Esquire. Today, his great-grandson, Garry, owns and operated the bed and breakfast with his wife Shelly. Garry, who was born in the house, is the 5th generation of Blackmores to live here. He and Shelly lovingly restored...and saved from demolition!...the house and opened it to guests 4 years ago. It is a beautiful place. 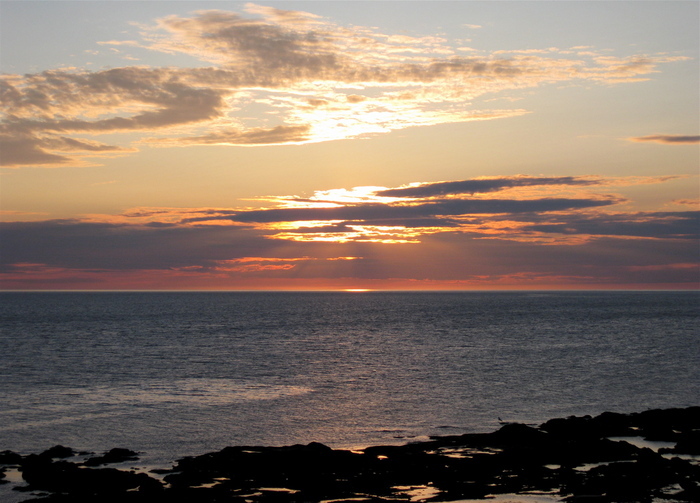 From the town's website: "Bonavista is where modern North America began. On June 24th, 1497, an Italian explorer sailing under the British flag for King Henry VII, made landfall in the New World. "O Buona Vista," Giovanni Caboto was said to exclaim after nearly two months at sea. Oh happy site! News of the existence of this New Found Land - and the riches of the Grand Bank fishery - spread throughout Europe after Cabot's return journey across the Atlantic." The story was that Cabot found the cod fishing so plentiful that buckets could be dipped in the ocean and pulled out filled with fish. 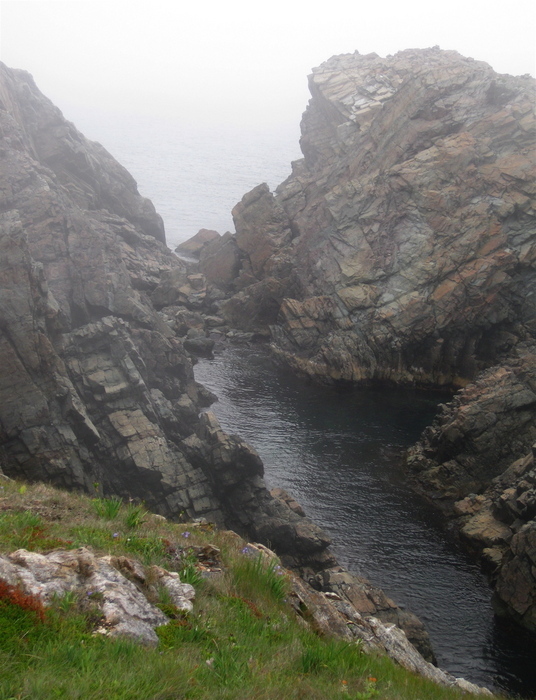 Our trip to Bonavista didn't allow us to see much of the beautiful view. The fog foiled us once again! 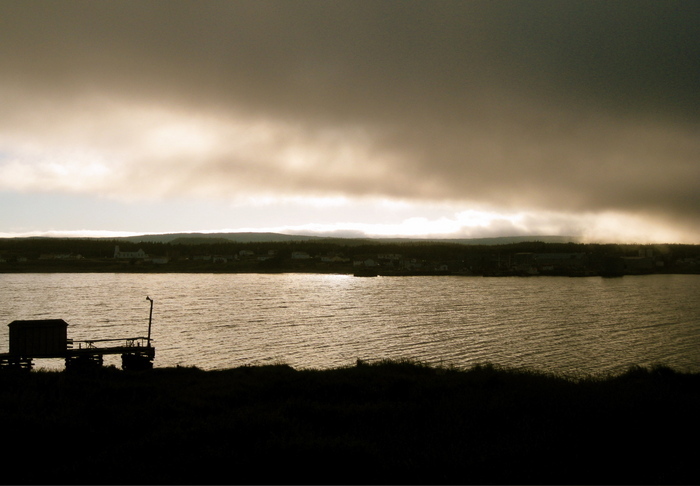 Look at it in this photo as it rolls over the harbor of Bonavista. 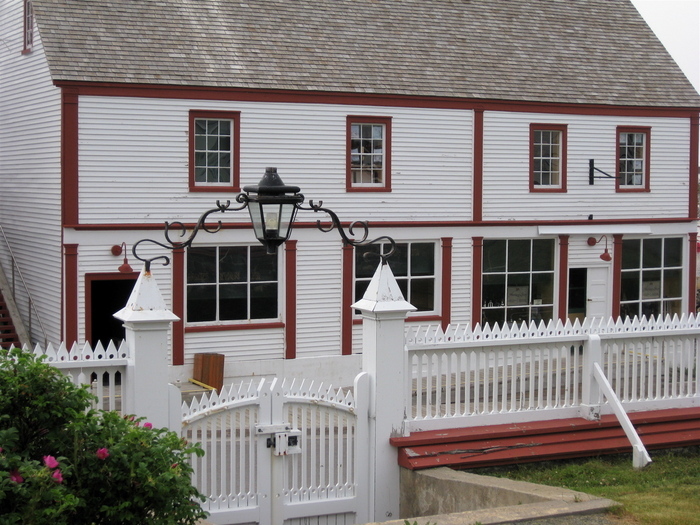 Ryan Premises is also a Canadian Historic Site. For more than 100 years this merchant-run salt fish complex served as a key economic force behind Bonavista's inshore fishery. The Ryan family made their fortune buying and curing salt cod and selling it all over the world. 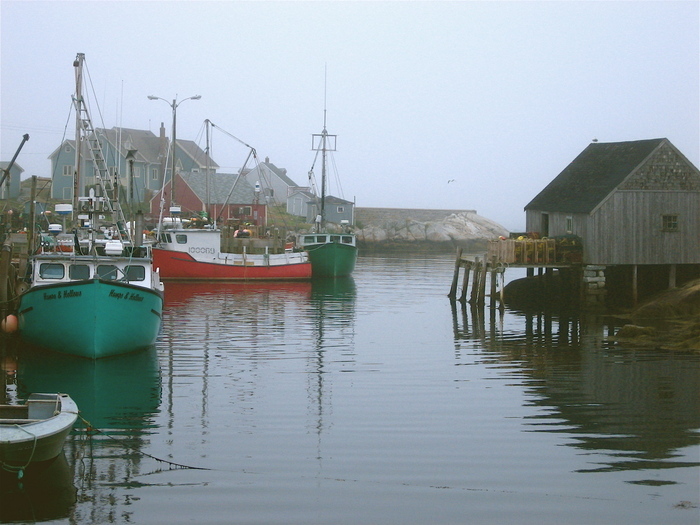 For five centuries the commercial fishery has profoundly influenced the settlement and economic development of Newfoundland and Atlantic Canada. Today, the site of the Ryan family home and mercantile houses a museum to the cod fishing and other similar industries in Canada. We learned more than we ever thought possible about the cod fishing industry and its profound effect on the history of Atlantic Canada. This photo is of the Ryan family home, now a museum of art that depicts the area's history. Notice the gas light above the gate. We had never before seen a gas light that was not on a pole. 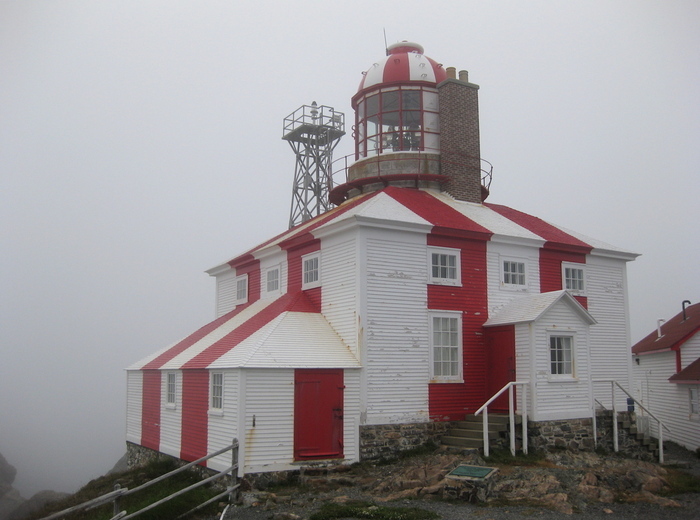 The point at Bonavista is know for its scenic views, its historic lighthouse (seen here in the fog), and the puffin colony that lives there. 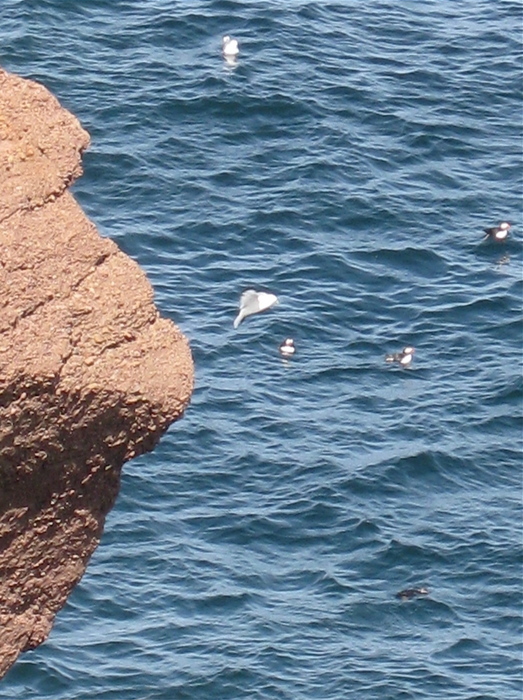 A view from the point, looking down onto the rocks and into puffin territory. 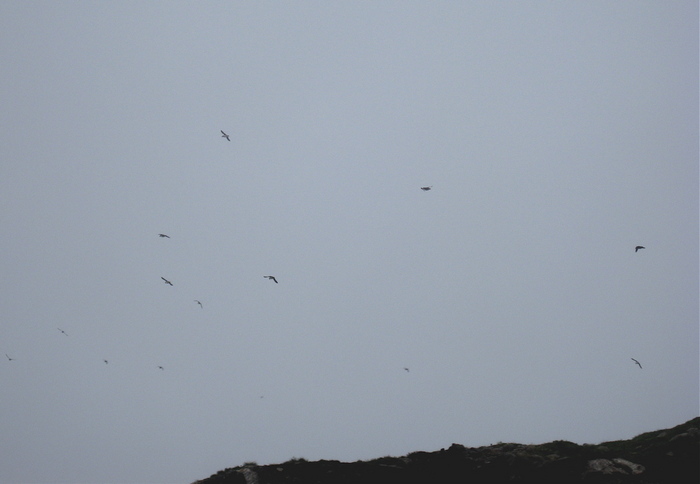 We did see the puffins, but in the fog all we could see of them was their return from the sea. Most of them were returning with fish in their beaks. OK, National Geographic would never accept this photo, but it was as good a close up as we could get! Not a colorful sunset tonight, but the fog and clouds made for an interesting photo. 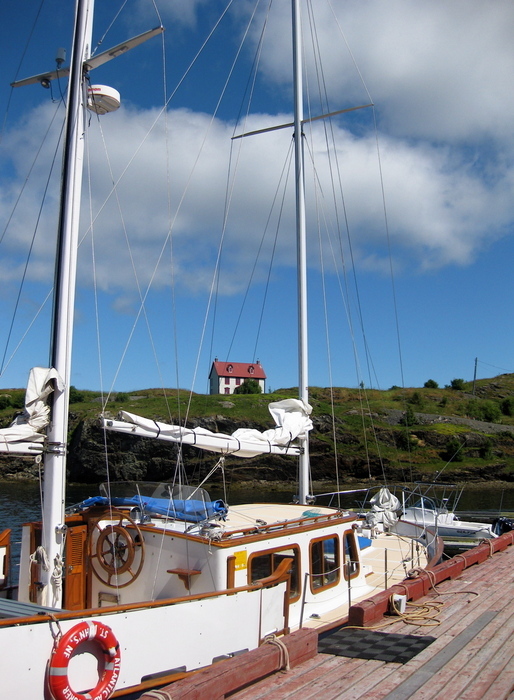 After dinner in Bonavista, we returned to Captain Blackmore's for the evening. The next morning we were up bright and early. After a lovely breakfast with a couple from Ontario, we drove to St. John's, our last destination of the trip. 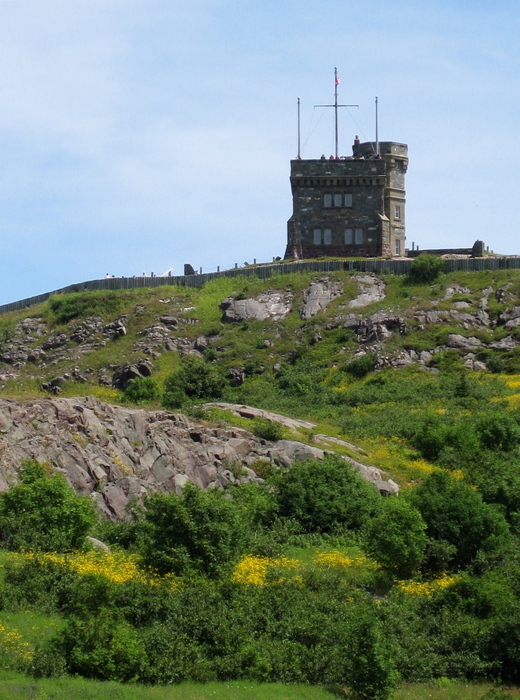 One of the National Historic Sites in St. John's is Signal Hill. 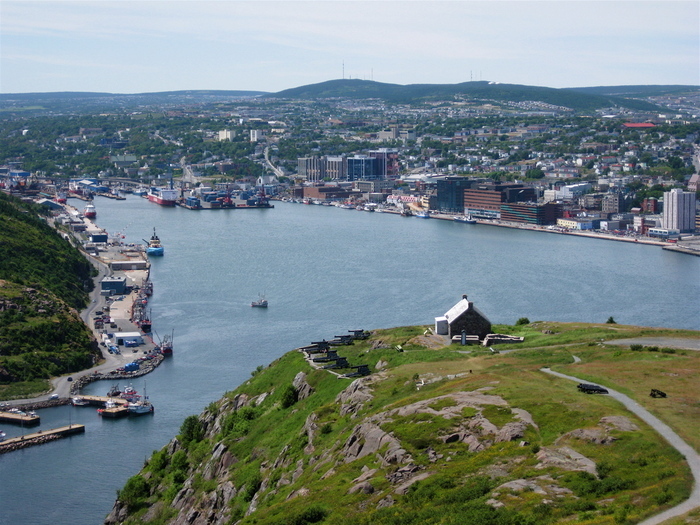 The hill overlooks the city and harbor of St. John's, and because of its strategic placement overlooking the harbour, fortifications have been placed on the hill since the mid 1600s. This photo is of Cabot Tower, construction of which began in 1897 to commemorate Queen Victoria's Diamond Jubilee in 1897 and the 400th anniversary of John Cabot's landfall in 1497. Signal Hill is also the site where the first transatlantic wireless transmission was received by Guglielmo Marconi in December 12, 1901, in an abandoned fever and Diphtheria hospital which has since been destroyed by fire. The transmission originated from Marconi's Poldhu Wireless Station, Cornwall, England. 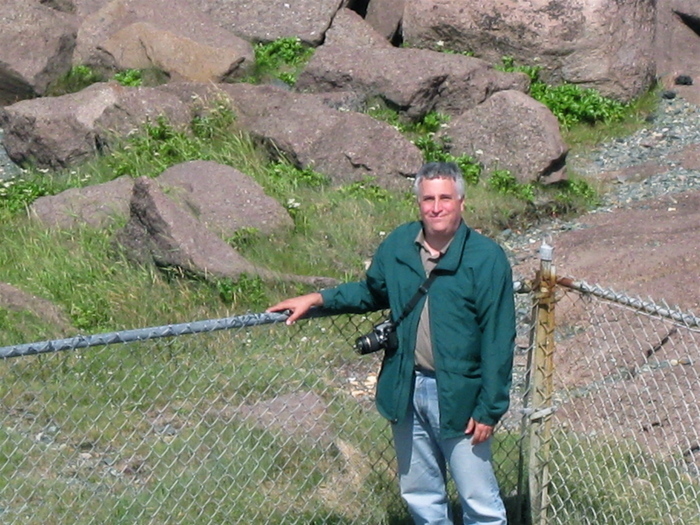 As you can see from this photo, St. John's harbor was easily defended from site near and around Signal Hill. the harbor nowadays is quaint and picturesque. 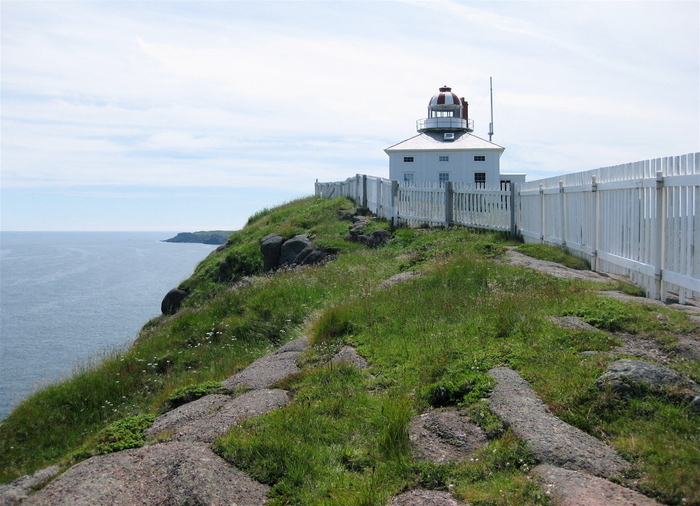 There has been a lighthouse operating at Cape Spear since September 1836. 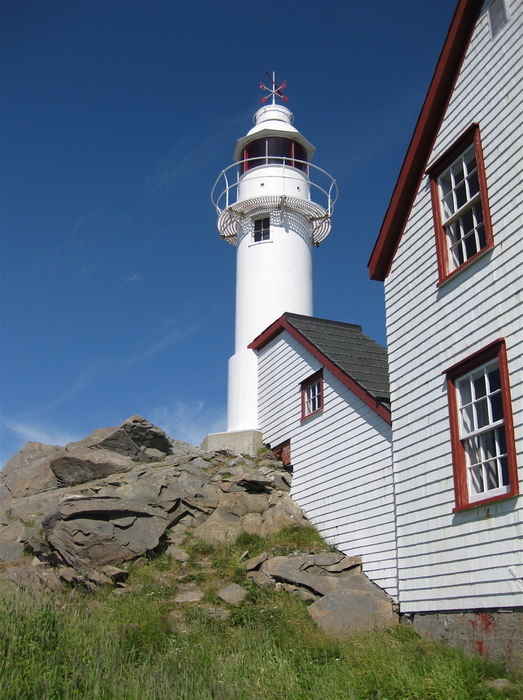 The original Cape Spear lighthouse was the second lighthouse built in Newfoundland; the first was built in 1810 at Fort Amherst, at the entrance to St. John's Harbour. 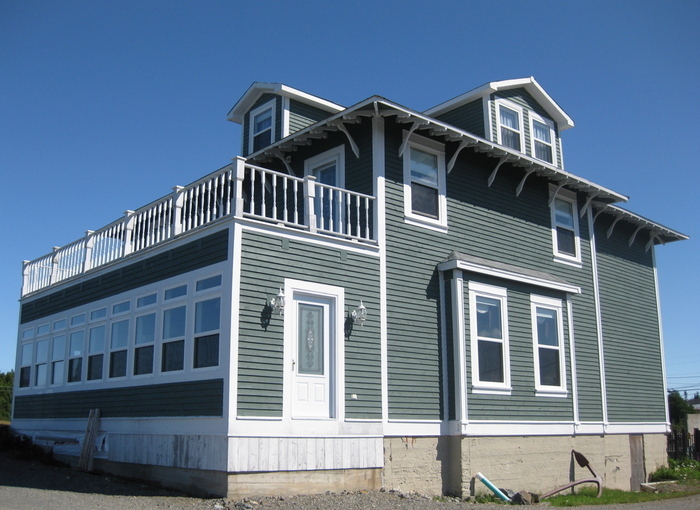 The original lighthouse building and the light keeper's residence have since been restored. 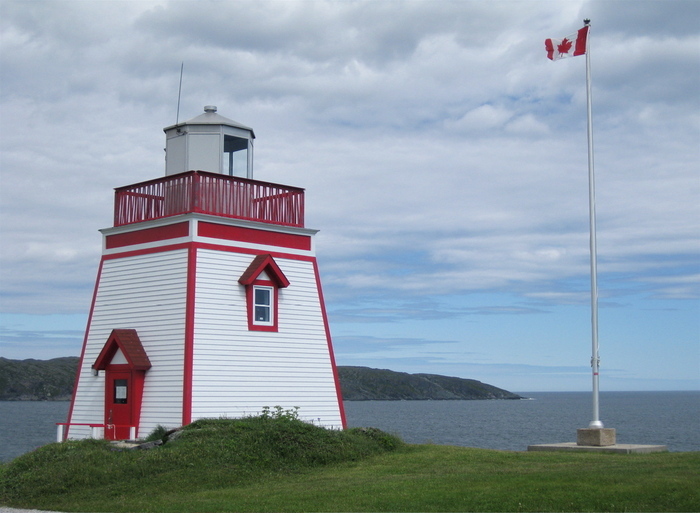 It is the oldest surviving lighthouse in Newfoundland and the location has been designated a Canadian National Historic Site. A new concrete building was built to house the light in 1955. 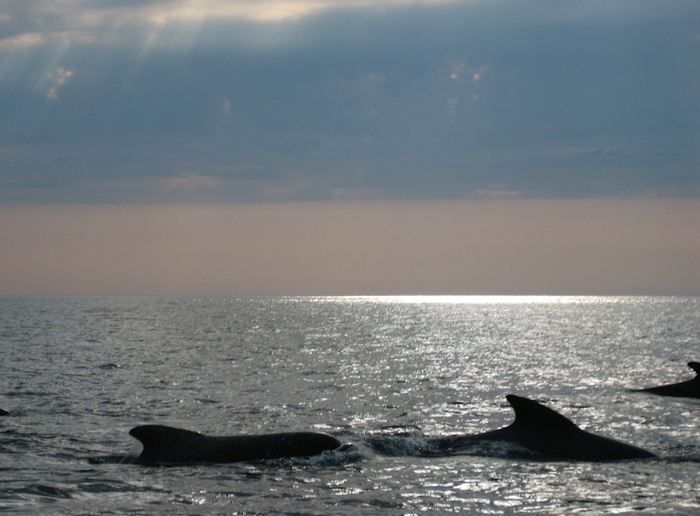 Due to their relative abundance Minke whales are often the focus of whale-watching cruises setting sail from St. John's. Minke whales are frequently inquisitive and will indulge in 'human-watching'. 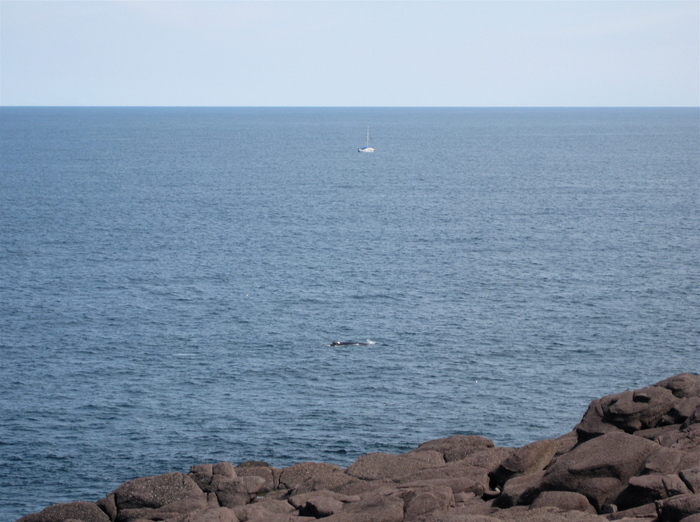 We didn't have to take a cruise...we were able to watch this Minke, who was fairly close to the rocky shore, from the look off at Cape Spear. Finally, some stationary puffins! 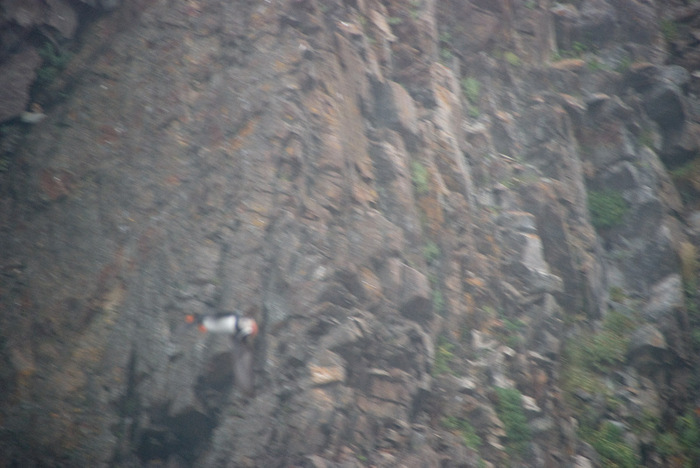 We had to use our telescopic lenses to get this close to the puffins. They are so cute and are very entertaining to watch! They can be distinguished from other sea birds by their unique orange, black and white color combination and their squat beaks. They are almost comical. 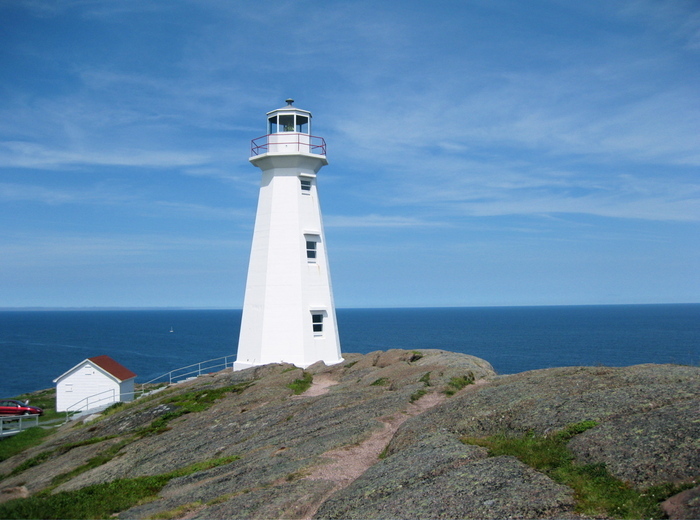 Cape Spear, located on the Avalon Peninsula, is the easternmost point in Canada (52°37'W). There is currently a dispute as to whether Cape Spear is the most easterly point in North America. Nordost Rundingen, Greenland or Semisopochnoi Island, Alaska could also be considered to be the most easterly point. But ask any Canadian...Cape Spear is indeed the eastern most point in all of North America. 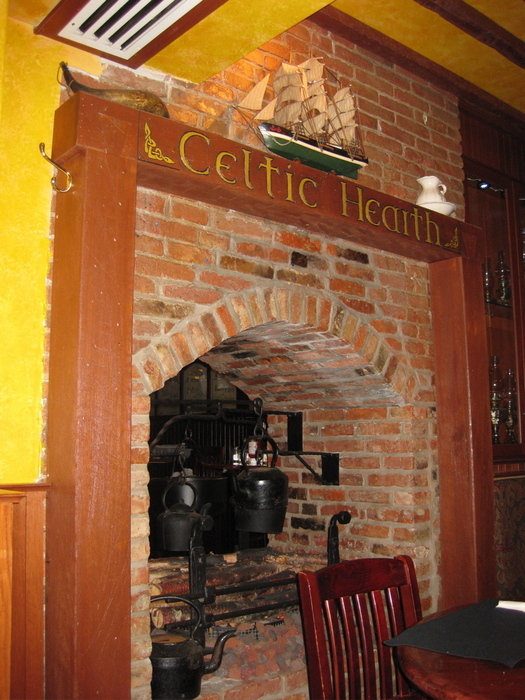 On our last evening in St. John's...and in Newfoundland...we ate dinner at the Celtic Hearth in one of the older sections of St. John's. Here we ate Cod Tongues, something we had been trying to avoid our entire time in Newfoundland. Cod tongues, the fleshy tongue of the cod fish, is one of Newfoundland's better known specialties and can be found at practically every restaurant, when available. Cod tongues along with cod cheeks are considered delicacies. We had ours deep fried, and while anything tastes good when it is deep fried, let's just say that we don't have to try them ever again.